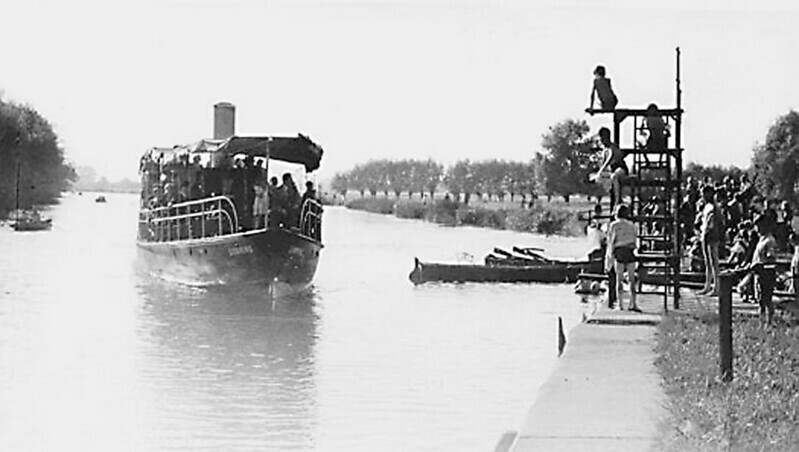 - Leaving Benson lock towards Wallingford - (BS0020) It is difficult to date this picture but the length of the lady's dress would indicate either side of the First World War. It is however interesting, in that a punt pole is in use, in the traditional manner. 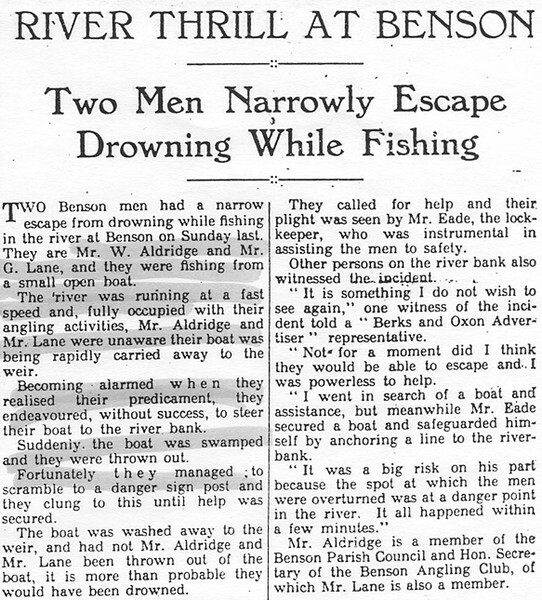 Generally, in the Benson area, due to the depth of the water, punt poles were rarely used, the punt being propelled by paddles. This was invariably the case in the 1940s and 1950s. - Ferry Boatman & Boy - (BS0033) Looking up toward the weir. Tall chimney has gone from the mill. 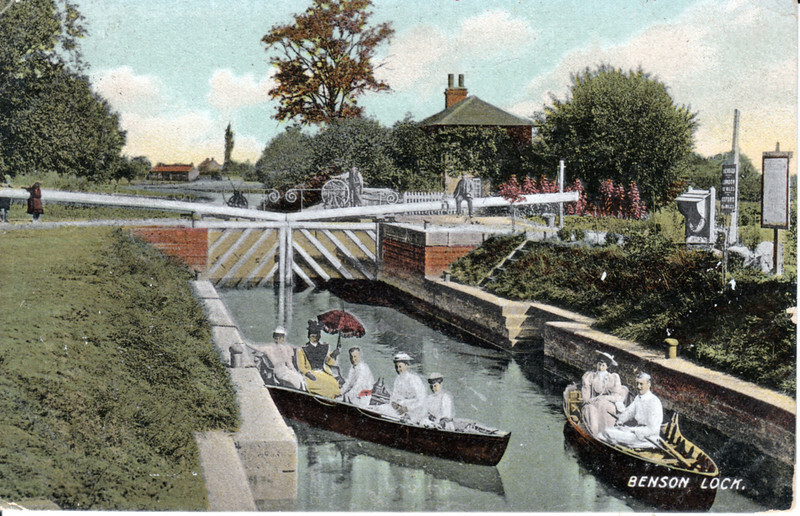 - Boating in the Lock - (BS0111) Edwardian boating. Very old photo. Pre 1914. In the distance you can see the coalyard. Some of the infrastructure may be newer. Is the photo genuine? - Thatched Boatshed - (BS0210) Adjacent to old coal wharf. 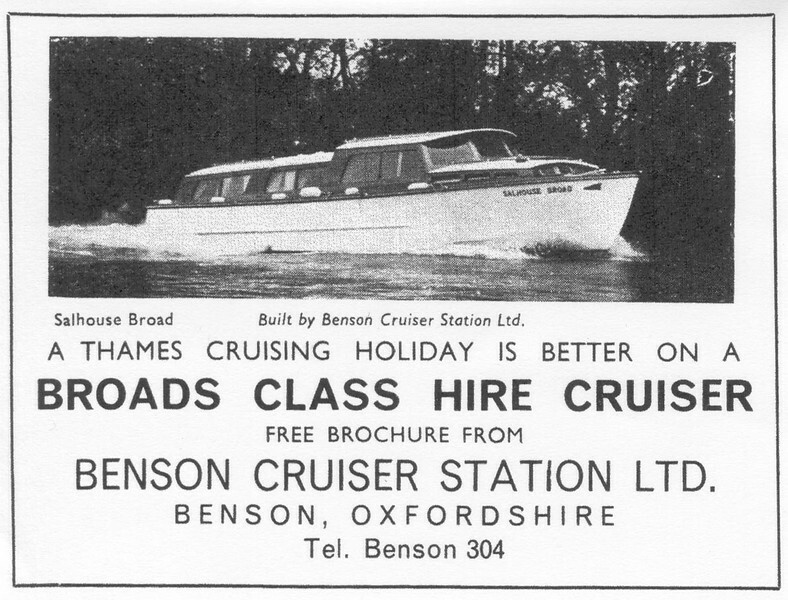 - Hire Cruiser advertisement - (BS0979) Many families from the UK and overseas took their annual holiday on a Benson boat. 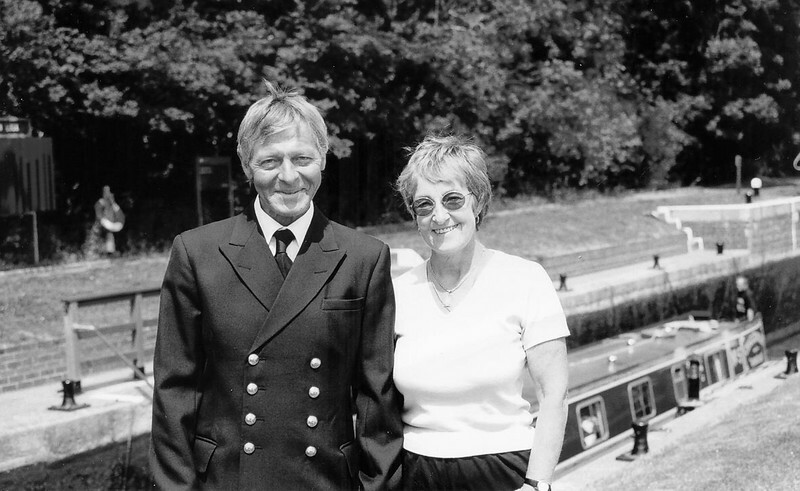 - Alan & Tina Hastings - (BS0982) Picture here at Benson Lock in 2002 after 23½ years as resident Lock Keeper. 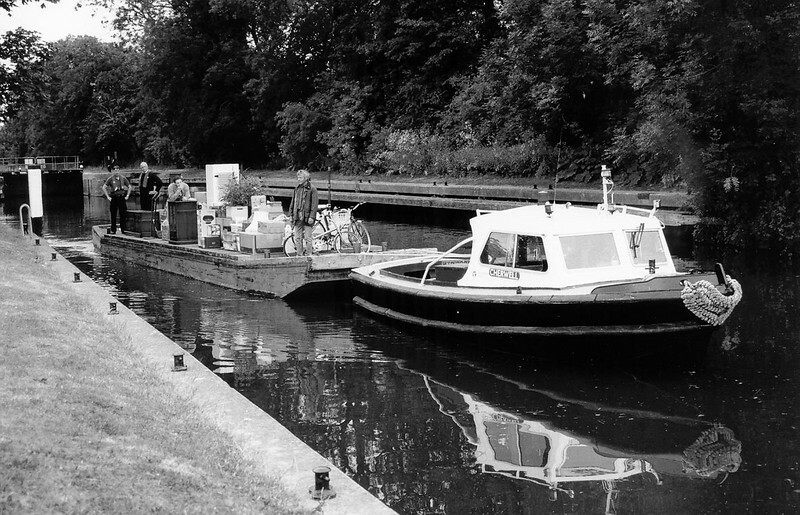 - Moving house - (BS0983) Lock Keeper and is wife, Alan and Tina Hastings, moving house after his retirement in 2002. 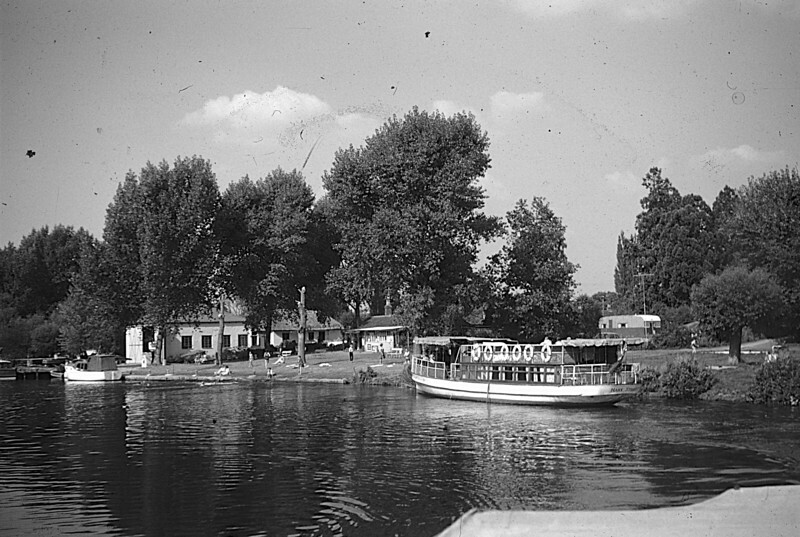 The first stage of their journey from their island home to Somerset was in the time-honoured tradition - with their furniture and belongings carried on an Environment Agency barge. .
- Punt below Benson Weir - (BS0302) Note the use of paddles rather than pole because of the deeper water around Benson. 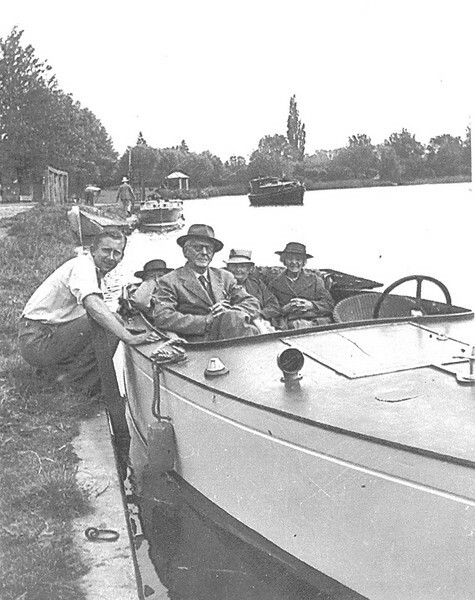 - Men in Motorboat on Thames - (BS0417) Any clues to identities?. 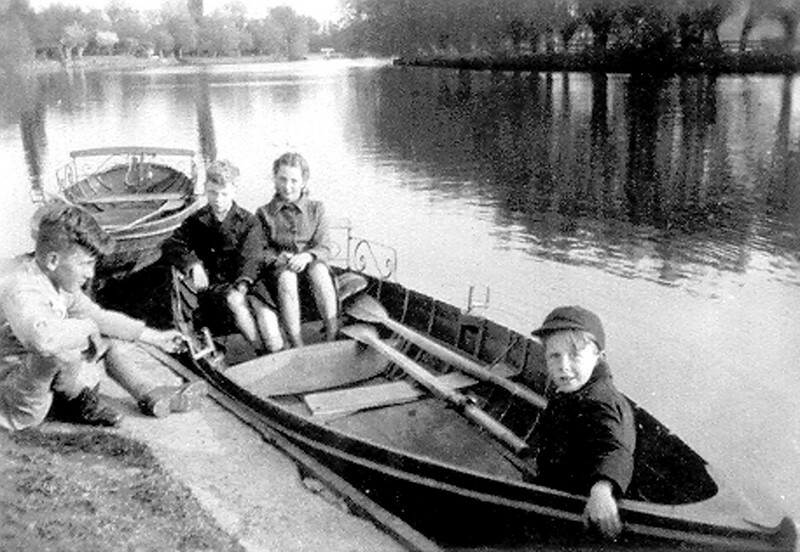 - Children in rowing boat - (BS0482) Typical of children's freedom to "muck about in boats" in contrast to today's strict supervision and obligatory life jackets. 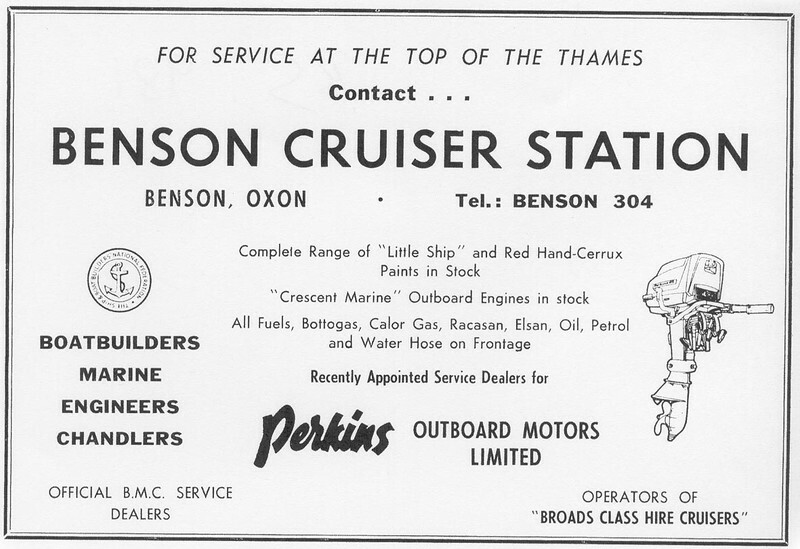 - Leaving Benson by steamer- (BS0573) Date of photo - 7 September 1959. 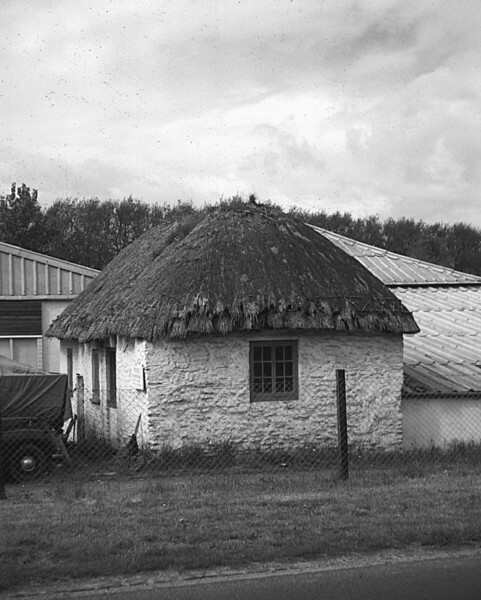 - Thatched boat shed - (BS0605) Beasley's cottage, later Frank Young's winter boat shed, about to be demolished (photo taken in May 1962). The familiar present day boat sheds are visible behind it. 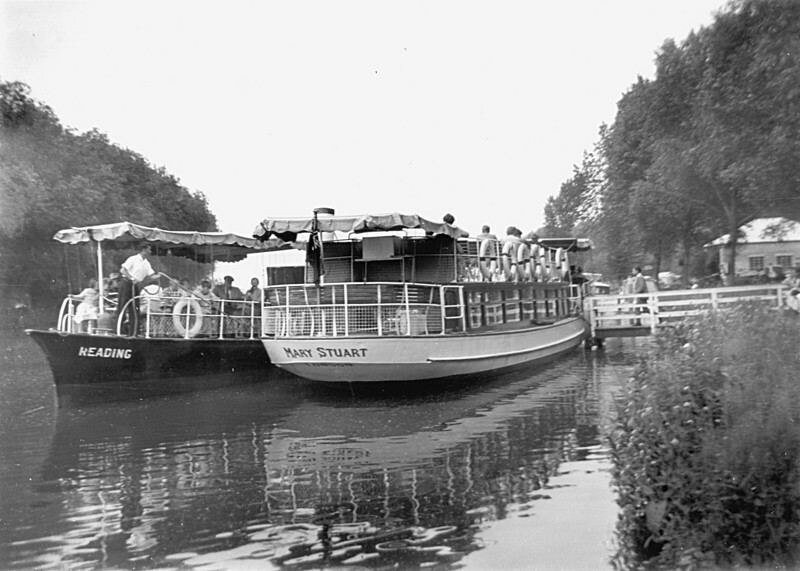 - Salter's Passenger Steamers - (BS1124) The steamer landing stage was opposite the present café . Later it was at Rivermead, just opposite the present paddling pool. 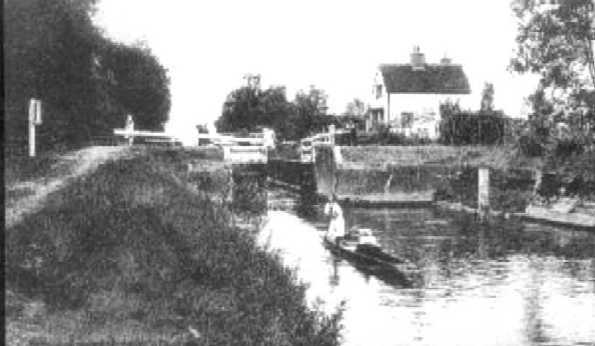 - Benson's first pound lock c1868 - (BS1328) This is a photo of the lock built in 1788. 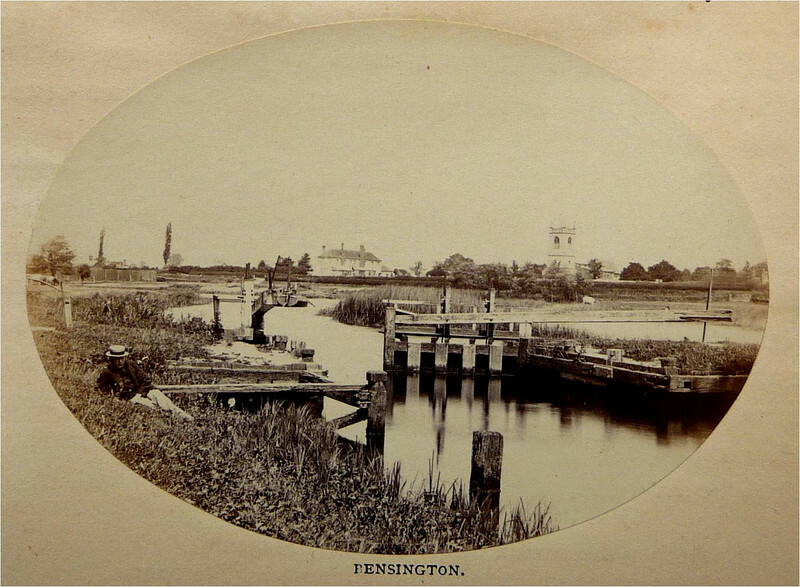 It was replaced by the present structure in 1870; the photographer (Russel Sedgefield) was just in time! Pictures of it must be extremely rare. 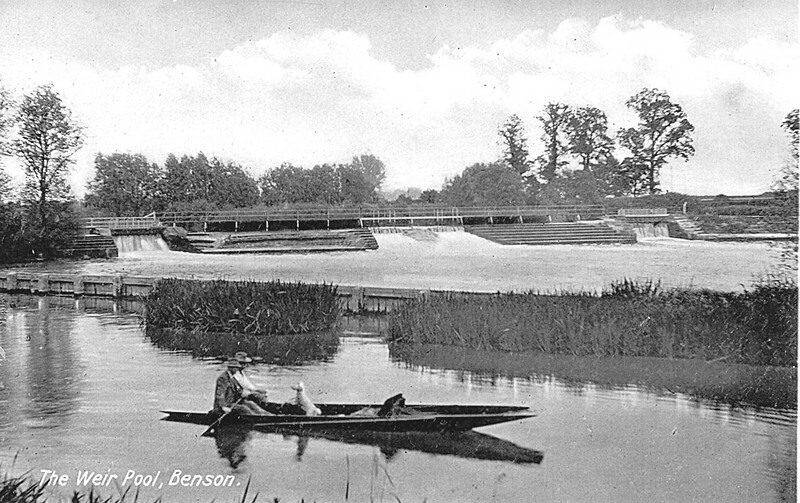 In 1869 the Thames Conservancy bought the weirs at Benson from private ownership. 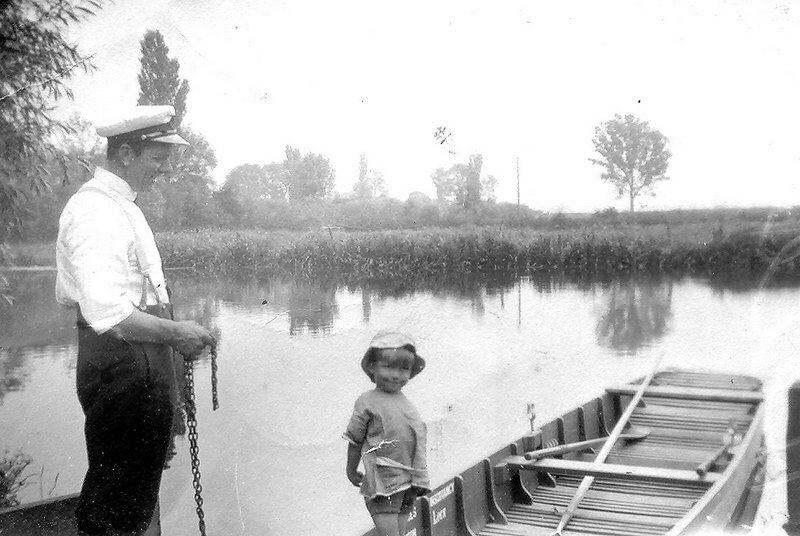 - Lock-keeper Henry James and Alice Moffat - (BS1443) Keith Dyer writes: My grandfather Henry James Moffatt was the lock-keeper at Benson from somewhen about 1905 until about 1926, and my mother and four uncles were born in the lock keeper's cottage. He was born at Bromley in 1880 and served in the Boer war from 1899-1902. He was a reservist and fought in the first World War also. He died of pneumonia in 1926 and his grave is in Benson churchyard. 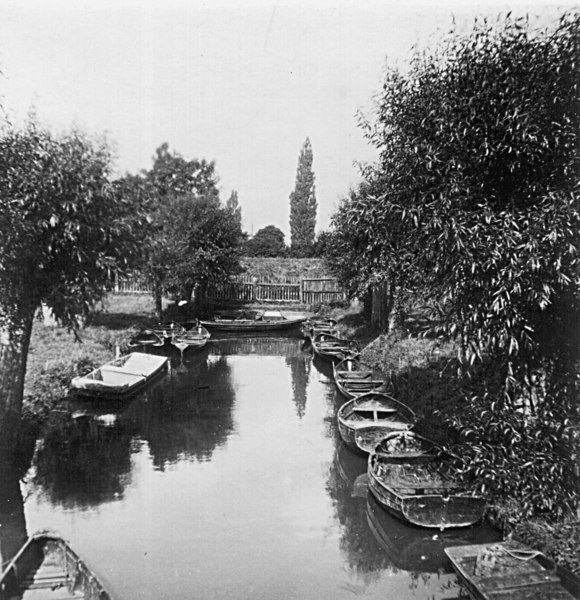 His wife Alice took over as lock keeper while he was at war, and after his death, and served teas and refreshments as well, helped by the children. 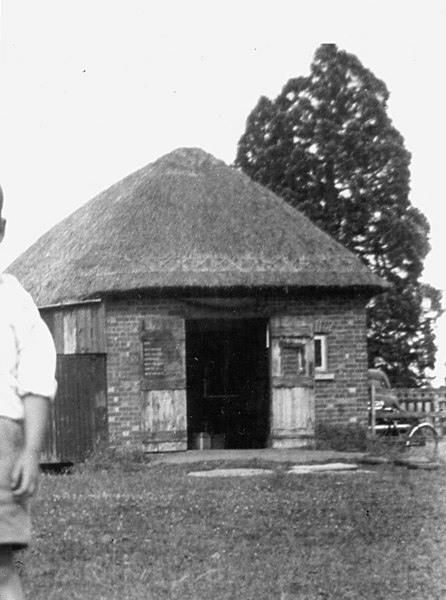 The cottage was burned down in 1913, and a new one built. 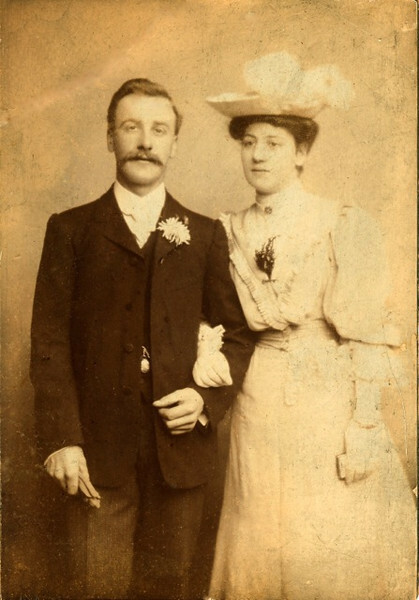 The photograph above shows Henry and Alice at their wedding in 1905. My uncles, Alec and Jack were both well known local rowers, and won several cups in Thames regattas. My mother also rowed and won pairs races with my aunt. My grandmother outlived my grandfather by over 50 years, and died and was buried at Woolacombe in Devon. She lived at Cholsey for many years after she left the lock keeping, and then lived in Goldsmith's Lane in Wallingford until she moved to Woolacombe to be near my uncle Vic Moffatt. He was the landlord of the Coach and Horses at the Kyne Croft in Wallingford, having taken over the pub and the green grocery business next door from his father-in-law Mr Morris. Vic was well known to many of the people who worked at Hydraulics Research, particularly Alan Price and Mary Kendrick, who used to drink there. He died in 2010. Also my father was associated with Streatley in the 1920's where he managed the hydro-electric station until it burned down in July 1926. He therafter worked at the Wallingford office of the Edmundsen's Electric Company. I have been in contact with the Streatley history group, and they sent me copies of some old phots taken of the burning station with my father and paternal grandfather in the foreground.